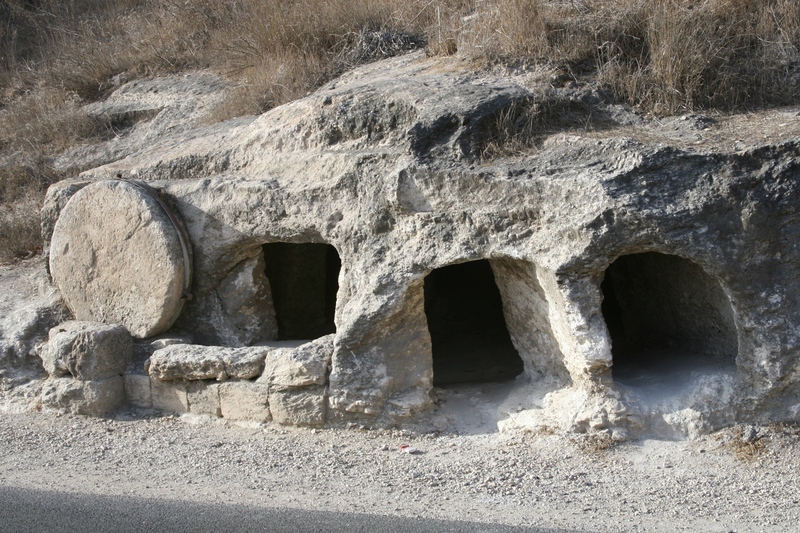 A first century tomb in Israel. Photo by Joelle Chilcott. In looking through Luke’s account of Jesus’ resurrection (and glancing at Matthew, Mark, and John), I was struck by the fact that none of them record the resurrection itself. There are plenty of witnesses to the fact of Christ’s resurrection. The women see the empty tomb, Peter (and the beloved disciple) verify their story. Jesus appears on the Emmaus road, in the garden, in the closed room, and to at least five hundred brothers and sisters at once (as Paul records). There is plenty of evidence for the fact that Jesus was bodily raised, but no record of the resurrection itself. I happen to think this omission is a blessing. First, it keeps our focus on what is most important: Jesus was raised from the dead. I imagine that if Luke recorded the resurrection itself we would spend excessive amounts of time debating the scientific accuracy of the accounts and get bogged down. The resurrection is not a set of data to be dissected as much as it is a reality that confronts and embraces us. In the resurrection we deal with a historical fact, but even more so we deal with the Resurrected One – Jesus. Resurrection is a miracle. The Holy Spirit didn’t seem to think we needed to know how he managed to do this, but simply that it happened. We could easily be distracted by the ‘how’ and lose focus on the ‘who’ and ‘what’ of resurrection. The point of the story is Jesus – the Resurrected One. Second, the resurrection of Jesus is what some scholars would describe as a ‘liminal experience.’ It is an experience at the edge (or ‘limit’) of our comprehension. What has happened defies our categories and explanations. The resurrection of Jesus turned the world of the disciples on its head. It changes everything – for them, for us, for the whole cosmos. Any language that Matthew, Mark, Luke, and John could have used would only have cheapened what really happened. They could only attest to its reality. They could only stand in awe of the Resurrected One.